We are delighted to share with you some exciting news from St Neots business, Keystone Marketing. 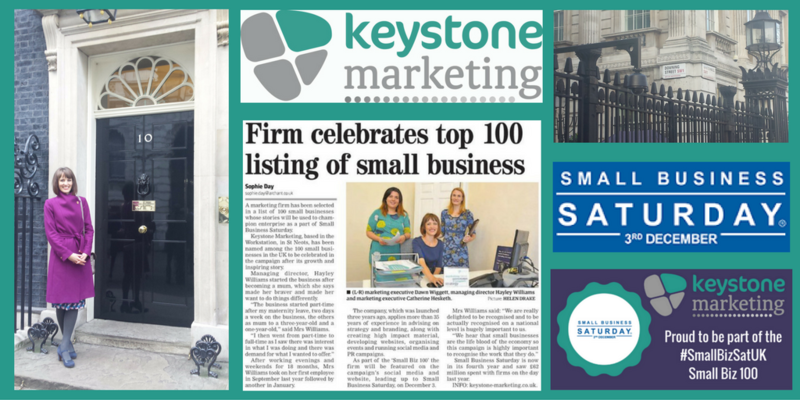 Following the announcement that the marketing and communications company had been selected as one of Small Business Saturday’s top 100, Keystone Marketing was championed by the campaign with a day dedicated to showcasing their business and a trip to Downing Street in December. Keystone Marketing, based in our St Neots Business Centre, announced their achievement of gaining a place in Small Business Saturday’s ‘Small Biz 100’ in September of last year. Small Business Saturday is a national campaign which recognises and celebrates the success of small businesses across the UK. In the run-up to the main Small Business Saturday celebration which was held on the 3rd December 2016, each of the 100 businesses selected was assigned a day dedicated to their organisation and promoted by the team behind the campaign. Keystone Marketing’s day was on Friday 2nd December, just one day before Small Business Saturday and the culmination of the campaign. It was no doubt a tremendously exciting (and busy) week for Keystone Marketing as on Thursday 1st December, Managing Director Hayley Williams, joined other small business owners at Small Business Saturday’s Downing Street reception. Read more about Keystone Marketing’s Small Business Saturday experience here. We are absolutely thrilled for Hayley and the rest of the team at Keystone Marketing and congratulate them on all their hard work which has earned them this thoroughly deserved accolade.